Tergeste, as Trieste was named during the Roman era, is to be discovered on foot, to fully taste her richness and to breathe, through her streets, buildings and monuments, her 2000-year-old history. Opening hours: Shops in Trieste normally open around 9 am both during winter and summer. In the summertime opening hours are generally a bit longer. 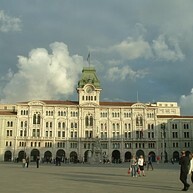 Trieste’s city centre offers a nice walk among criss-cross roads in the Borgo Teresiano part of town, while taking in the many elegant Neo-classical buildings that define the city’s architecture. Situated by the sea front, the city holds some gorgeous scenery, which can be experienced when visiting the Castle of Miramare. 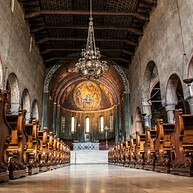 The cathedral´s main feature is a large 14th-century Gothic rose window and central location. 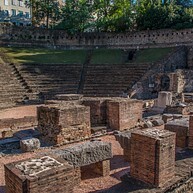 There are three entrance portals, decorated with Roman material. To the side stands the 14th-century bell tower built in large blocks and decorated with a Romanesque style border and Gothic relief work depicting San Giusto, the city’s patron Saint. 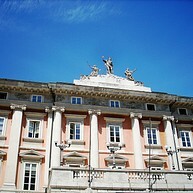 This museum provides an interesting opportunity to get an overview of the history of Trieste as a city born of the sea. 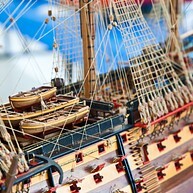 In connection to that, a comprehensive exhibition of reproductions of different types of ships and means of navigation. In 1855, the Archduke Massimiliano of Hapsburgs built this palace and lived here with his wife Carlotta del Belgio, until 1864. Though beautiful, this castle holds a tormented story behind it: Massimiliano was killed in Mexico in 1867, and Charlotte died insane in a Belgian castle, sixty years later. The Duke of Aosta, who lived there some sixty years later, died in Africa during World War II. At the end of the Rilke path, you will find the Castello Vecchio (10th-11th century), which survives today as the ruins of a tower and an arch. The Castello Nuovo is today a group of buildings of different ages, with a central courtyard and surrounded by a beautiful park. 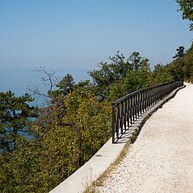 Sentiero Rilke is one of the most enchanting paths in Carso, a wonderful walk starting from Sistiana and leading to the castle of Duino along white cliffs. Named after Rainer Maria Rilke, the famous poet from Prague, who loved walking here. This cave is a spectacular jewel of natural phenomena. 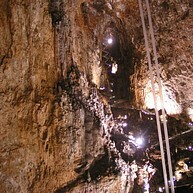 It was discovered in 1840, and opened to the public in 1908. An indeed unusual excursion into what looks like another world. 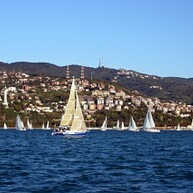 Enjoy the lovely views of Gulf of Trieste with its deep blue waters. On a warm day you can enjoy a picnic here. Take an evening and visit the lovely Teatro Verdi for an opera or theatre experience. Have a look at their website to see what is on while you are there. Take a walk along these beautiful trails with gorgeous panoramic views. Following the main trail will take you about 1.5-2 h, so bring comfortable shoes. This lovely home is a contribution from the Costantinide family because of the legacy of Anna Segre Sartorio. Inside you will find furniture from the rococo and neo-gothic style. INAF Trieste Astronomical Observatory was founded by the Empress Maria Theresia of Austria and dates back to 1753. 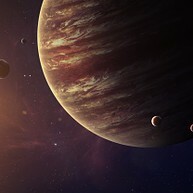 This Astronomical Observatory is a great place to visit if you love science. 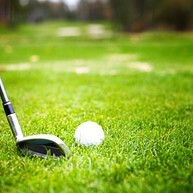 Take the chance and play some golf under the Trieste sun at this 18-hole course. They have a practice area which can be used even on a rainy day.